NordVPN is more than a VPN, coming jam packed with a variety of unique anonymity and security tools no other service offers. Alongside strong encryption, 27 countries and blazing fast speeds NordVPN has your back in any situation. NordVPN is a larger VPN company who has been around for a few years, building an established VPN service with some of the most up-to-date features we have seen yet. Read the full NordVPN review below to get a glimpse at the service. In VPN markets, the endless list of the same features can seem repetitive, stating they have security, no logs, a variety of countries and the rest, but what if features didn’t have to be so boring? Welcome, NordVPN. NorVPN comes bundled with an array of features including dozens of security tools, dozens of privacy tools and is adding more every month! NorVPN is one of the first VPN’s of its kind, coming pre-loaded with dozens of features at a more-than fair price point. Speaking of, lets take a look at NordVPN prices. Starting at only $8 a month, NordVPN comes in at a phenomenal price point, and this doesn’t even include us talking about the features yet, which all come free of charge with your premium subscription to NordVPN. All NordVPN accounts come equip with a six device limit, meaning you can have up to six devices connected to the VPN at one time, even on the smallest $8/mo plan. 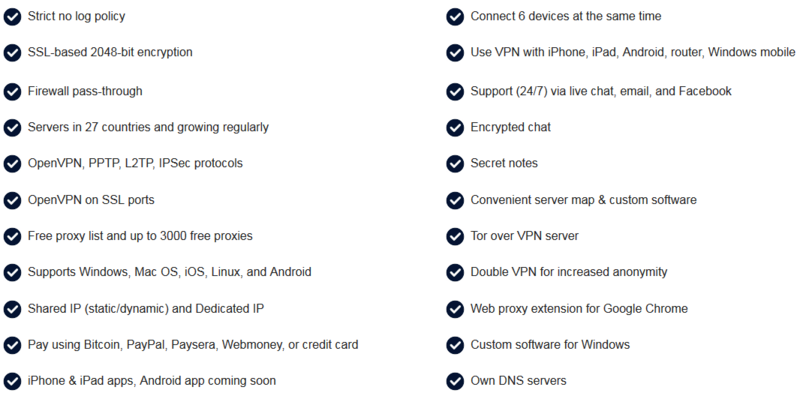 NordVPN offers an array of features, actually on NordVPN’s feature page they list out 22 separate features all NordVPN accounts come equip with. A picture of all features listed according to the official website is below, but if you would find out how they all work, keep reading the NordVPN review to find out. The listed features include a strict no logs policy, 6 simultaneous connections, 2048-bit encryption, full device support, firewall, live support, 27 countries to connect to, encrypted chat, multiple encryption protocols (OpenVPN, PPTP, L2TP), secret notes, custom Windows client, free list of 3,000 proxies, Tor over VPN, double VPN, shared or dedicated IP’s, kill switch and their own NordVPN DNS servers. NordVPN comes jam packed with security tools, online anonymity tools, privacy tools and a lot more to ensure your security is their top concern. To start, NordVPN offers double encryption, where your connection is filtered through two NordVPN servers encrypted with AES-256-CBC two times in a row, ensuring your communications make it safely to their destination with no eavesdropping. NordVPN is so dedicated to privacy and ensuring your communications are delivered safely to the web they offer Tor over VPN with one click. This means you first connect to Tor, then connect to the VPN, adding several additional layers or privacy. This is not hard to do either, NordVPN has a one button setup for this Tor to VPN technology. Alongside a long list of free tools, some small features to highlight include a VPN kill switch, DNS leak protection, proxies and secure chats. Kill switch ensures the VPN is running at all times, if the VPN connection disconnects or one packet goes out of the loop, the entire Internet connection cuts itself, ensuring every single packet is sent through the VPN and if it fails, it will cut the entire connection to that device. DNS leak ensures your DNS queries are not leaked elsewhere. NordVPN also offers a list of 3,000 ready-to-use proxies that you can freely use atop your VPN or on your own. Lastly, NordVPN offers secret notes and encrypted chats, which allow you to securely communicate with friends and family or leave notes. As NordVPN stouts top of the line privacy and security, lets get down to it and see what they offer and get a clear look into their encryption standards. All in all it appears NordVPN does not keep any logs of what users do on the VPN server or impose any restrictions, as bittorrent is available across all 25 countries. 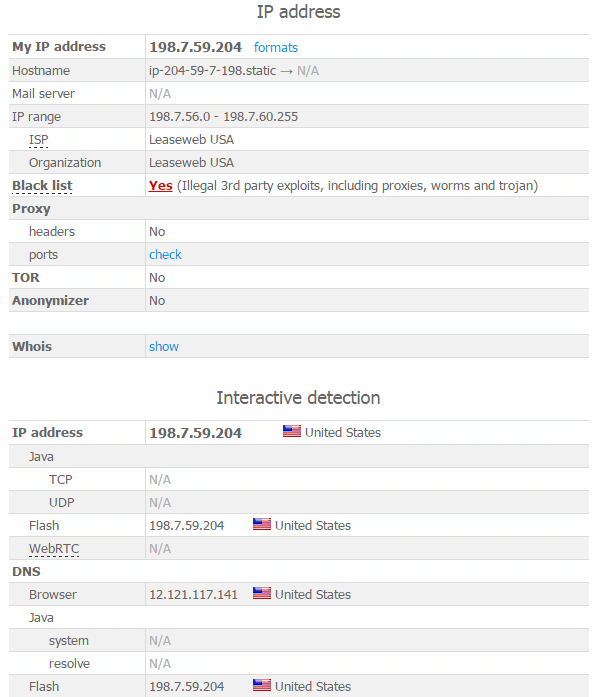 NordVPN’s website is a bit vague on encryption, the only two mentions were saw said they utilized SSL-based 2048-bit encryption and AES-256-CBC which is defiantly a secure protocol. NordVPN’s detail on their encryption gives us peace of mind that the company is using a secure protocol to protect our connection, unlike many other companies who just state they encrypt the connection yet don’t know the slightest thing about encryption. NordVPN’s clearly lays out security and privacy policies letting us know this company means business and can be trusted with sensitive communications. Signing up for NordVPN was extremely easy, once you find your desired package and are directed to the checkout page, you are required to setup an account and are allowed to choose from six different ways to pay, including bitcoin, the anonymous cryptocurreny. NordVPN allows you to purchase the VPN with an anonymous-by-default currency, allowing sales to be almost 100% anonymous. Following the simple checkout, NordVPN directed us to a simple setup page that allowed us to easily setup the VPN within just a few clicks. A huge feature with any VPN provider is their dedicated clients and how easy it is to use the service from the tools provided by the VPN. One of NordVPN’s great features is their dedicated Windows client, allowing you to easily use a variety of tools with one click connections. NordVPN’s Windows client is one of many great NordVPN features that works flawless. The client has several built in tools to help you make the smartest and fastest connection possible. Before we talk on all the great features, here is a picture of the NordVPN Windows client. As you can see, several servers have their own grouped label along with the server usage percent. The label is the type of server it is and NordVPN has an array of servers for different connection types. Currently, NordVPN offers servers with configurations including double VPN, Tor over VPN, ultra fast TV, anti-DDoS, dedicated IP servers and standard VPN. So in short, instead of having to setup the double VPN feature, if you want to connect to a double VPN, just connect to the server and it will be done for you. Same goes for Tor over VPN. 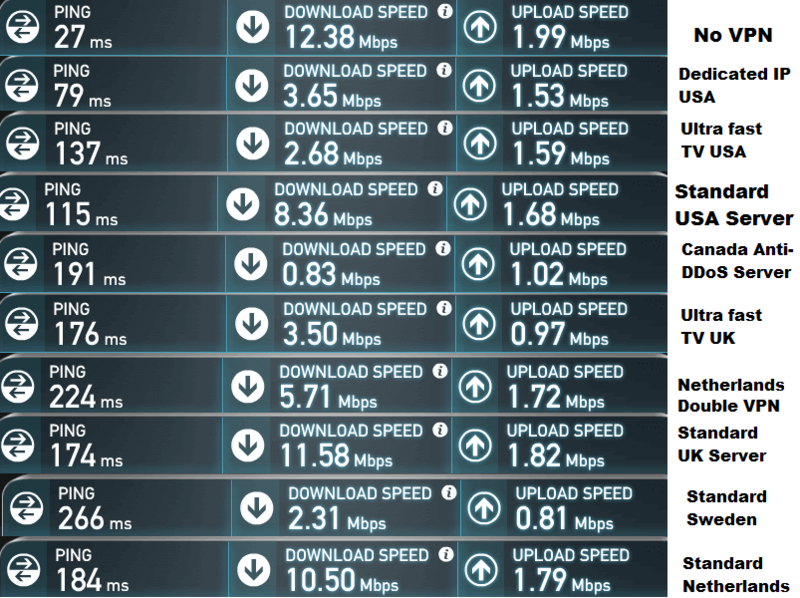 Ultra fast servers claim they are blazing fast servers optimized for streaming. Anti-DDoS is a great VPN server optimized for gamers and anyone with a large target on their back handling DDoS attacks. Connecting to any desired VPN server is a breeze, and all connections are made in just a few seconds. Currently, NordVPN only has dedicated clients for Windows and iOS devices, however, company officials informed the author that Mac OS X and Android clients are currently in the works and should be released before the end of the year. NordVPN’s iOS app works phenomenal, nearly identical to the Windows app. It opens a screen with all the severs and the features and allows you a one button click to connect. Overall, whether you’re a Mac OS X, iOS, Android or Windows fan, the VPN always works phenomenally. It will just require you to use the old and bland OpenVPN client, which is easy to use and secure. Actually, a large portion of VPN services only offer configuration files, so NordVPN is one step ahead of the game. One thing we did not like about NordVPN was the consistency of their speeds on their specialty servers. A few times when using NordVPN’s special servers optimized for a certain service the speed was exceptionally fast, but more often than not, we ran into a number of speed issues. Yes, the speed delay still allowed us to stream HD content, on certain servers, but the speed was not optimal. We ran into hangups, delays, choppy internet among a few other issues on a number of their Ultra Fast servers, Double VPN, anti-ddos among others. However, on the other hand, a number of their standard VPN servers perform flawlessly with little to no speed difference. This even goes for servers stretching halfway across the world, the speed was still optimal and able to perform at 100%. 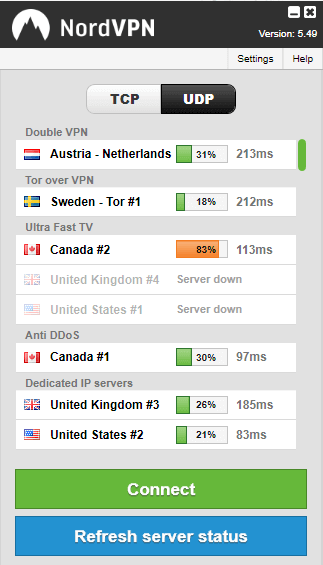 NordVPN needs to emphasize less of specialty servers and focus on making the speed of all servers consistent. What is the VPNFTW security test? This test is where we turn on the VPN and ensure all the security features are in check and working straight out-of-the-box. We install the client and ensure the VPN does not leak any sensitive information we do not desire with our first connection. Go ahead and check out our guide to check if your VPN connection is secure. Right out of the box we went ahead and tested out the connection where we found zero leaks. We tested this a variety of times with the DNS Leak Protection turned on and off, we found the connection to still be secure with zero leaks. Again, when we ran our usual DNS Leak Test we found zero leaks, and this was with the DNS Leak Protection setting turned off. With DNS Leak protection ON, NordVPN forces your machine to use their designated DNS servers that only work alongside NordVPN. NordVPN company policy states that zero logs are retained on VPN users during their sessions and that nearly anything is allowed, aside from obvious criminal use. The company claims they store zero logs and only retain usernames, passwords and billing information in the event of a refund request. NordVPN has a solid compliance policy and does not log or block any services when using the VPN, according to their terms of service. Overall NordVPN provides a stellar service jam packed with more features than we knew what to do with. We definitely recommend NordVPN to Netflix streamers, Internet browsers, bandwidth hogs among those who are privacy conscious. If your looking for a VPN that’s more than “just another VPN” then NordVPN is your #1 choice! With a variety of features and servers stretching across the globe, NordVPN comes in at 4 stars and defiantly gets VPNFTW.com’s stamp of approval! 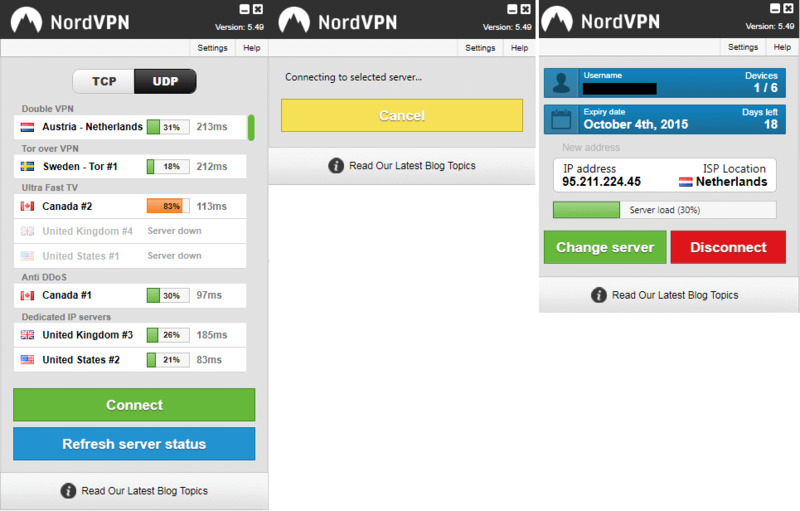 Check out the official NordVPN Website! I read your review about Nordvpn. They now have a client for Android and I have installed it on my mobile phone. Perhaps it is time for you to write a new review of Nordvpn? 1) The Connection to the VPN server gets disconnected sometimes. I first noticed this problem when the wifi connection got very weak because I was not close to the router. That is, when browsing when the wifi connection was weak the Browser had problems and then the VPN connection was disconnected. I thought the VPN connection would get reconnected when I got back closer to the wifi router, but that did not happen and I had to manually reonnect again to a VPN server. the most irritating part of this is that I got no warning/notification that the connection to the server had been disconnected. I had thus been surfing around for some time in unprotected mode without knowing about it. So I started to turn off the WIFI when I went too far from the router using the GSM net instead. But I have noticed that I still get disconnected from the VPN server sometimes and it does not re-establish connection by itself. I just get disconnected and stay disconnected until I manually connect again. Not much of a kill switch! 2) My location – country – is leaked. When going to sites the websites figure out that I am from Sweden and use that information to supply me with advertisement in Swedish. I use a server in Germany and have set language to English, but I still get advertising for Swedes. I have cleared the browsers from cookies etc and used two different browsers. I have tested with two different browsers. And the text is in Swedish. This does no feel very anonymous!! Thanks for the review Stefan. I have just learned of NordVPN from a ptp DL site and was reviewing NordVPN to purchase. All in all I like the hidden IP for what I will be using it for. I had planned on using NordVPN on two Android devices but maybe not so much now. There isn’t really much I would be doing on my phone that I need the VPN protection but it would be nice to have it. May I ask what cell phone you have? Mine is a Samsung 6 Active. I have trouble staying connecting to the internet on it all the time! It’s freaking annoying. Just wondered if your phone was a Samsung as well. Hey we are running Android too, but it could just be a poor VPN app. Are you talking about using NordVPN app on your phone? I am a little confused. Cheers Joan! !